Adventure PhotosAdventure photos, stock images of camping, backpacking, skiing, cross country skiing, snowshoeing adventures, outdoor adventures and activites, hiking, biking pictures, mountain biking photos, kayaking pictures, camping, backpacking, fishing, dog mushing and more. Photos and images from the Iditarod, Alaska's premier sled dog race. Dog sled teams race from Anchorage to Nome, down the Yukon river across arctic tundra. Dog mushing pictures, Iditarod start. Winners include Lance Mackey pictures. Photos and images of campsites, tents, tentsites, backpackers, backpacking and camping. Backcountry campsites in Alaska, including ANWR (the Arctic National Wildlife Refuge, Denali and Wrangell - St. Elias National Parks), as well as the southern Appalachian mountains. Canoeing photos, and paddling, boating, canoe trips, paddlers, canoes, whitewater and flatwater. Canoeing on lakes and rivers, including the Red Trail, in the Okenefokee Swamp in southern Georgia. Also canoing and canoes in Moraine Lake, Banff National Park, Alberta, Canada. Photos and images of kayakers, whitewater kayaks, kayaking photos, paddlers and boating photos. Whitewater kayaking images on the Futaleufu River and the Baker River in Patagonia, Chile, as well as the Chattooga River, Georga and South Carolina. Extreme sports, adventure sports, action pictures. Photos and images of hikers, backpackers and campers. Hiking and backpacking photos from the wilderness. Hiking and backpacking in Wrangell - St. Elias National Park, the Arctic National Wildlife Refuge and Denali National Park, Alaska, as well hiking and backpacking on the Appalachian Trail, in the north Georgia mountains. Trail running photos. Photos and images of outdoor athletes, exercising, adventures, running, stretching, jogging photos, etc. Women running trails along the Chattahoochee River, in and around Atlanta, Georgia. Whitewater rafting photos. Photos of whitewater rafting on the Futaleufu River, Patagonia, Chile, as well as rafting float trips on the Canning river, in the Arctic National Wildlife Refuge, Alaska. Big hits, boats tipping over and flipping, surfing massive waves and whitewater rafts. Alaska sea kayaking photos. tock photos of sea Kayaking in Icy Bay, Wrangell - St. Elias National Park and Preserve. Sea kayaking near Mt. St. Elias, kayaking with harbor seals, glaciers and icebergs, mountains, Alaska fjords, sea kayakers kayaking, paddling, touring, recreation, adventures, boating Alaska. Photos of cross country skiing, skiers, xc skiing, backcountry skiing, telemark, nordic, winter sports. Skiing photos, Wrangell - St. Elias National Park and Preserve, Alaska. Winter hiking, snowshoeing photos, backcountry adventures in Alaska in winter, backpacking, hiking and trekking with snowshoes. Alaska PhotosPhotos and images from Alaska; Alaskan life and recreation, Alaska outdoor photos, people in Alaska. Alaska nature photos including various national parks, such as Denali National Park and Preserve, Wrangell - St. Elias National Park and Preserve, the Chugach National Forest in Kenai Peninsula, Alaska's Chugach mountains, the Alaska range. Other Alaska photos here include images from Southeast Alaska, arctic Alaska, including the Arctic NationaL Wildlife Refuge, Iditarod pictures and more. Alaska winter photos, the aurora borealis in Alaska and photos of Alaska landscapes and wildlife. Photos from Denali National Park, Alaska, including Mt. McKinley photos. Aurora borealis over Mount McKinley photos; Pictures of outdoor adventures, camping, hiking and backpacking; Polychrome Pass, boreal forest, tundra, the Alaska Range. Scenics and landscape pictures from Denali, including travel photos and tourism photos. Denali wildlife photos include grizzly bears, caribou, moose, wolves and more. Photos of Wrangell - St. Elias National Park and Preserve in winter. Images include Mount Blackburn photos, Mount Sanford Photos, boreal forest photos, winter landscape and scenic photos from Wrangell - St. Elias National Park. Lots of snow! For more photos of the park, visit the main Wrangell St. Elias National Park Photos page, and also the Photos from the Saint Elias Coastal Range page. Photos and images from the Kenai Peninsula, Alaska. Photos include Chugach National Forest and Kachemak Bay. Mostly landscape and scenic pictures, including the Chugach Mountains, Resurrection Pass Trail. Alaska landscape photos of Alaska mountains and Alaska mountain ranges. Landscape photos of snow-capped peaks like Denali and Mt. St. Elias, or Blackburn. Mountain Ranges include the Chugach Mountains, the Alaska Range, the Saint Elias Mountain Range, the Brooks range and the Wrangell Mountains. The magnificence and grandeur of Alaska mountains and Alaska Landscapes..
Wrangell - St. Elias National Park and Preserve photos. Photos of Mount Sanford Mount Blackburn, Mount Drum, the Copper River,the Wrangell Mountains, Chugach mountains, fall color photos, plus a variety of scenics, aerial photos, wildlife photos, landscapes, backpacking and adventure photos and more. Also photos of the rustic and historic towns of McCarthy and Kennicott. Be sure to look over the other galleries for Wrangell St. Elias National Park, including Winter Photos and also Photos from the Saint Elias Coastal Range. Wrangell - St. Elias Park backpacking trips. Stock photos and images from Alaska, including arctic Alaska, the Dalton highway, southeast Alaska, Yakutat, Haines, the Tongass National Forest, etc. People, travel and tourism photos, activities such as fishing and hiking, bushplanes photos, etc. This gallery might show snippets and examples of which you can find many more in the specific Alaska galleries. For more photos of specific areas and wildlife of Alaska, visit the photo galleries for location using the above navigation menu. Stock photos of the Arctic National Wildlife Refuge, ANWR pictures, arctic Alaska. Photos of birds and wildlife, including caribou photos, rough-legged hawk photos, as well as scenics and landscape photos. Stock photos of oil exploration and development in the Arctic National Wildlife Refuge. These Arctic National Wildlife Refuge photos are a collection of images from around ANWR, including the Section 1002 area of the ANWR coastal plain, the Brooks Mountain Range, the foothills and the coastline. The Arctic National Wildlife Refuge is over 19 million acres of wilderness on the North Slope of Alaska, the largest national wildlife refuge in the country. Currently over 8 million acres of the Arctic National Wildlife Refuge are designated wilderness, with proposals by the F&WS to protect even more of the refuge with that designation. For other ANWR photos, see the Alaska Polar Bear photos album of the site. Photos of the Northern Lights, or Aurora borealis. Photos of the northern lights over Mt. McKinley, Denali Park, Northern lights pictures over Mentasta Mountains in Wrangell St. Elias Park. Stock photos of the northern lights in the Brooks Range and Gates of the Arctic National Park, Aurora borealis images over the Arctic Ocean, Alaska. Photos of the Alaska coast along Wrangell - St. Elias National Park; Yakutat Bay, Pacific Ocean, Malaspina Glacier, St. Elias Mountain Range. Icy Bay images, the Hubbard Glacier pictures, photos of the Bagley Icefield, Mount Logan, and more. Photos from the coastal region of Wrangell St. Elias National Park and Preserve, including wildlife and icebergs. Just a small subset of pictures from Wrangell St. Elias, please be sure to check the main page for hundreds more Wrangell St. Elias National Park Photos, as well as the new Wrangell St. Elias Park in Winter Photos. Also see Mt St. Elias Photos, Mt. Blackburn Photos, and Mt. Sanford Photos. Photos from Gates of the Arctic National Park, including the Arrigecth Peaks and the Brooks Mountain Range region. Photos include well known mountain peaks such as Xanadu, Caliban, Ariel, as well as Valley of the Maidens and Aquarius, popular climbing destinations in the Arrigetch Peaks region, Gates of the Arctic National Park and Preserve, Alaska. Gates of the Arctic Park backpacking trip. Stock photos of Mt. McKinley; Denali photos, as it's more commonly know. The highest mountain in the United States, mt. McKinley stands 20,320 feet (6,194 m) above sea level. Mt. McKinley is more often referred to by its native name, Denali, which translates as 'the great one'. Generally photographed form the north side of the mountain, every tourist to Denali National Park hopes to catch a glimpse, and if really lucky, the chance to shoot some photos of Mt. McKinley. Mount Sanford photos. Mount Sanford is one of the largest mountains in the Wrangell Mountains, and the 4th highest mountain in Wrangell - St. Elias National Park and Preserve. At 16 237' ASL, it's one of the notable mountains in North America. Mount Sanford is the 6th highest peak in the US. Mount Sanford is a Shield Volcano, and after Mount Bona and Mount Blackburn, is the 3rd highest volcano in the USA. These Mount Sanford photos were largely taken from the east or west side of the mountain. Classic views of Mount Sanford include from the Richardson Highway, near Glennallen, overlooking the Copper River Basin, as well as from the Slana - Nabesna Road, in Wrangell - St. Elias National Park and Preserve. More images of Wrangell - St. Elias National Park and Preserve. Stock photos of Mount Blackburn, in Wrangell - St. Elias National Park and Preserve, Alaska. Mount Blackburn stands 16 390' high, and is the tallest of the Wrangell Mountains. With one face having a prominence of over 11 000 vertical feet, Mount Blackburn is one of the world's great mountains - it is the 50th most topographically prominent peak in the world. These Mount Blackburn photos include aerial photos, winter photos of Mount Blackburn, as well as images from summer and fall, mostly from the southern side of the mountain. One of the classic viewpoints for Mt. Blackburn is from Kennicott, and another from the Richardson Highway near Glennallen. Appalachia PhotosPhotos and images from Appalachia, including North Carolina, Tennessee, Georgia, Appalachia Trail, Atlanta, etc. Photos and images from the Appalachian Trail, including sections from Georgia, North Carolina, Tennessee. Scenic photos, hiking and backpacking photos, hardwood forest pictures and more. Scenics and stock photos from around Georgia, including photos of the Appalachian Trail, Cloudland Canyon State Park, providence Canyon State Park, Amicalola Falls, Cohutta Wilderness, the Chattooga River, Chattahoochee National Forest photos, Chattahoochee River photos, Okefenokee Swamp photos, Georgia mountains and Georgia travel photos and more. Also added Lake Lanier photos. See also Atlanta Stock Photos for more pictures from Georgia. For outdoor recreation photos in Georgia, see the Trail Running Photos section. More Georgia photos in the Hiking and backpacking photos, and kayaking photos. Photos and images from the Great Smoky Mountains National Park, Tennessee and North Carolina. Photos include Cades Cove, tourism, whitetail deer, Appalachian Trail, and more. Horse photos from Cades Cove. Stock photos and images from North Carolina. Appalachian Trail, Nantahala Forest, and more. Photos and images from Tennessee, Chattanooga, Smoky Mountains, Nashville. Wildlife including whitetail deer, and scenic photos. Bird PhotosPhotos and images of wading birds, songbirds, ptarmigan, grouse, shorebirds. Raptor pictures, Great Gray owl photos, Great Horned Owls, bald eagle pictures, waterfowl photos, bird pictures from Alaska, Canada, Georgia, Florida, Montana and more. Photos and images of birds such as willow ptarmigan photos, white-tailed ptarmigan photos, spruce grouse, etc. Photos and images of songbirds, passerines and other small birds; recently added photos of Black-capped Chickadees and boreal chickadees, Pine Grosbeak pictures, Bohemian Waxwing photo, Savannah Sparrow picture, Wilson's warbler photo and more. Photos and images of shorebirds, including photos of Wandering Tattlers, Semipalmated plover photos, etc. Recently added Red Phalarope pictures, semi-palmated plover photos, dunlin pictures, oystercatcher photos and more. Especially note migratory birds on coastal plain of the Arctic National Wildlife Refuge, ANWR, Alaska. Photos and images of waders. Wading birds such as Great Egret photos, tricolored heron photos, etc. Photos of waterfowl; Barrow's Goldeneye photos, trumpeter swan photo, Harlequin ducks images, Pacific and Arctic loons, Northern Shovellers, Rednecked Grebes, Long-tailed ducks, wood ducks, tundra swans. Photos and images of a variety of birds. Birds of PreyPictures of Birds of Prey. Raptors, owls, eagles and predatory birds. Species include Great Gray Owls, Great Horned Owls, Eagles, Northern Harriers, Rough Legged Hawks and more. 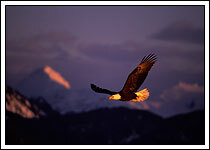 Photos and images of bald eagles, bald eagles flying, eagles soaring, diving, fishing, fighting, perched. Bald eagles images and photos from Homer Alaska - Haliaeetus leucocephalus pictures. There are over 200 bald eagle pictures on this site - For more bald eagle photos, please also see the Juvenile Bald Eagle photos album, and also the Photos of Bald Eagles fishing gallery. Birds of prey photos, Raptor pictures. Raptors such as Bald eagles, golden eagles, Rough-Legged Hawk photos, Northern Harrier photos, Great Horned Owl photos, etc. Photos of Birds of Prey hunting. Great Gray Owls pictures, Strix nebulosa. Raptor and Birds of Prey photos of these great silent hunters, Great Gray Owls. Great Gray Owls are referred to by the acronym GGO. Great Gray Owls frequent the northern forests of the Northern hemisphere. Other names for the Great Gray Owl are the Lapland Owl, the Spruce Owl and the Sooty Owl. Great Gray Owls are the tallest of owls, but not the heaviest. Great Gray Owl Taxonomy is Kingdom: Animalia; Phylum: Chordata; Class: Aves; Order: Strigiformes; Family: Strigidae; Genus: Strix; Species: nebulaso; Scientific Name: Strix nebulosa. Photos of bald eagles fishing, catching fishing, flying, diving, grabbing fish. Eagle pictures diving for fish, banking, twisting, turning, in flight. Bald eagles are both predators and scavengers. Predator photos, eagles hunting. I have over 200 bald eagle photos on this site. Please look at the Photos of bald eagles soaring and bald eagle portraits, and juvenile bald eagle photos as well. Haliaeetus leucocephalus images. Pictures of Great Horned Owls. Also called the Tiger Owl. Other common names for the Great Horned Owls include the Cat Owl and Hoot Owls. The most common owl in America, Great Horned Owls are found through much of the Americas, and are largely nocturnal. Great Horned Owl chicks photos, owlets. The adult Great Horned is also the only large owl with prominent ear tufts. Taxonomy for Great Horned Owls is Kingdom: Animalia; Phylum: Chordata; Class: Aves; Order: Strigiformes; Family: Strigidae; Genus: Bubo; Species: virginianus; Scientific Name: Bubo virginianus. Canada PhotosPhotos and images of Canada, from Alberta, British Columbia, Yukon Territories, and more. Canada pictures, western Canada, northern Canada, Banff National Park, Jasper National park, Cassiar highway photos, Alcan highway pictures, Mount Logan photos. Canadian Rockies pictures and Canada wildlife photos. Photos and images from British Columbia, Canada. Forest and mountain scenic photos from British Columbia, Canada, including fall colors, Cassiar HIghway pictures, wildflowers and more. Photos and images from Alberta, Canada. Canadian Rockies pictures; Photos from parks such as Banff National Park (Moraine Lake photos), Jasper National Park (Mt. Edith Cavell, Pyramid Mountain, Patricia Lake, Mt Kerkeslin, aspen stands, fall colors), and Kananaskis Country Provincial Park (Mt. Kidd, Kananaskis Lake). Wildlife and landscape photos, travel photos. Also visit the new galleries of Banff National Park photos and Jasper National Park photos for more photos from those areas. Stock photos of Banff National Park, the Canadian Rockies photos, locations such as Moraine Lake photos, Two Jack Lake, Vermillion lakes, etc. For more photos from the area, see also photos under "Alberta Photos". Stock photos of Jasper National Park; locations include Mt. Edith Cavell photos, Pyramid Mountain and Patricia Lake Photos, as well as Jasper National park wildlife photos. Images from the Canadian Rockies. Travel and tourism stock photos, Rocky Mountains pictures. See more photos also under the album "Alberta". Canadian Wildlife photos, photos of bighorn sheep, elk, grizzly bears and black bears, moose, foxes, wolves, coyotes and more. Wild animal pictures of western Canada. For a much greater selection, be sure to browse the species galleries found under the "Nature" tab at the top of the page. Hundreds of fox photos, elk photos, and more. Photos and images from the Yukon Territories, Canada. Taiga and boreal forest photos, scenics and stock photos from the Yukon Territory. Insect PhotosPhotos and images of insects and other assorted small critters. Insects and assorted tiny critters. Landscape PhotosScenic photos and landscapes; grand mountain views, glaciers, rivers and prairies, plains and forests. Natural landscape photos from North America, particularly Alaska, Canadian Rockies, and the American west. Landscape photos from the Appalachian mountains as well. Stock photos of Alaska glaciers and all things glacial. Photos of Alaska piedmont glaciers, tidewater glaciers, calving glaciers, icebergs, moraines, medial moraines, terminal moraines, lateral moraines, banding, ogives, icefields and other glacial features. Alaska glaciers include Kennicott Glacier, Hubbard Glacier and the Malaspina Glacier Photos in Wrangell - St. Elias National Park and Preserve, as well as the incredible Bagley Icefield. Photos showing erosive forces and results such as the classic U-shaped glacial valleys as well. Alaska fall landscape photos, scenic photos of autumn colors. Fall colors on the tundra, foliage on trees in forests during fall, Alaska fall colors, the Rocky Mountains in autumn, southern appalachian mountains in fall. Alaska landscape photos. Landscape images, scenics and landscape photos from around the world. Landscape photos from Alaska, Canada, Chile, and all across the US. Wyoming Landscapes, Montana and the Rocky Mountain landscape photos, the Appalachian Mountain photos and the Great Smoky Mountains National Park, and more. Winter landscapes, snow-covered scenes and scenic photos of winter. Photos of winter scenes from places like Denali National Park, Wrangell - St. Elias National Park, Jasper and Banff in Canada, etc. Mountains in winter, glaciers and glacial moraine winter photos. PlantsImages of plants, flowers, stems, trunks, forests, etc. Fall colors, wildflower pictures, flowers, lupine, forests, mosses, ferns and more. Plants and flowers. Photos of wildflowers, interesting plans and plant photos, such as patterns, leaves, fall color photos, alpine plants, lupine photos, coumbine photos, iris photos, berries and more. South America PhotosSouth America photos. Photos of Chile, the Andes Mountains, Patagonia, Orsono, Futaleufu and more. Photos of the Andes Mountains, Patagonia pictures, Region X. Osorno photos, Futaleufu River photos, Baker River pictures more. Travel and stock photos from Chile. Western US PhotosPhotos and images of places Montana (lewis and Clark National Forest, Glacier National Park), South Dakota (the Black Hills), the desert Southwest (Grand Staircase - Escalante National Munoment, Wasatch Mountains in Utah, and Grand Teton National Park and Yellowstone National Park in Wyoming. Photos and images from Montana, including Glacier National Park photos, Lewis and Clark National Forest photos, and more. Photos and images from the American Southwest, incudling Grand Staircase-Escalante National Monument photos, Utah, Arizona, and more. Stock photos of Yellowstone National Park photos, Grand Teton National Park photos, Wyoming pictures; See also wildlife pictures like elk photos and bison photos. Yellowstone photos like Mammoth Hot Springs pictures, lower Falls and Yellowstone River photos, Oxbow Bend pictures of Grand Tetons and more. Photos of horses and the Grand Tetons in Grand Teton National Park, Wyoming. Wildlife PhotosWildlife pictures, North American wild animal photos, such as Bighorn sheep, bison, black bears, canines, caribou, dall sheep, elk, fannin sheep, grizzly bears, moose, mountain goats, pronghorn antelope, small mammals, whitetail deer, and more. Stock photos of Alligators, American Alligator pictures, Alligator mississippiensis. Photos from Okefenokee Swamp, Georgia, of wild alligators. The American Alligator taxonomy is Kingdom: Metazoa; Phylum: Chordata; Class: Reptilia; Order: Crocodilia; Family: Alligatoridae; Genus: Alligator; Species: mississippiensis; Scientific name: alligator mississippiensis. Painted turtle photo, Chrysemys picta and more coming soon. Photos of arctic ground squirrels, snowshoe hare photos, lynx, red squirrel pictures, marmot photos, chipmunk photos, beaver photos, weasel photos, and more. Wildlife photos. BearsStock photos of bears. American bear species include the polar bear (ursus maritimus), grizzly bear or brown bear (Ursus arctos) and black bear (Ursus americanus). Polar bears are generally considered marine mammals, and are the largest of the bear family. Alaska brown bear, including the subspecies the Kodiak bear, are the next largest, with the grizzly bear (interior Alaska or Lower 49 states brown bears - Ursus arctos) followed by black bears. Bears are omnivores. Family Ursidae. These bear photos were largely taken in Alaska, but include some grizzly bear photos from Canada, and black bear photos from Canada and Tennessee. Bear photos, stock images of bears. Black bear photos, Ursus americanus, from Cades Cove, Great Smoky Mountains National Park, Tennessee. Photos of black bears from Kenai Peninsula, Alaska, Wrangell - St. Elias National Park, Alaska, and black bear pictures in British Columbia and Alberta Canada. Photos of bear cubs, including grizzly bear cubs, brown bear cubs, polar bear cubs and black bear cubs. Few animals are as cute as a baby bear cub. Bear cubs are generally born in January or February, helpless and hairless, blind and unable to fend for themselves. Polar bear cubs leave the dens in February or March, and grizzly bear, brown bear cubs and black bear cubs generally leave the dens with their mother around middle of April. Bear cubs of all species typically stay with their mother, the sow, for 2-3 years before they leave and must fend for themselves. Bear cub mortality is very high. See more polar bear photos here. Grizzly bear photos, Ursus arctos images. Grizzly bear pictures, also called brown bears, from Katmai National Park, Alaska. Stock grizzly bear photos from Denali and Wrangell St. Elias National Park, Alaska, and grizzly bears from Canada, including Yukon Territory and Kananaskis Country, Alberta. For photos of grizzly bear cubs, please be sure to visit the Grizzly Bear Cub Photos page. Alaska Grizzly Bear Photo Tour. Grizzly bear, or American brown bear Taxonomy is Kingdom: Animalia; Phylum:	Chordata; Class: Mammalia; Order: Carnivora; Family: Ursidae; Genus: Ursus; Species:	arctos; Scientific Name: Ursus arctos. Photos of baby bears, brown bear cubs and grizzly bear cubs - Ursus arctos. Cute young bear cub pictures from Katmai National Park and Preserve, Alaska. Photos of sows with cubs, bear families and babies. Also, be sure to visit the main Grizzly Bear Photos page for more great bear photos. Grizzly bear, or American brown bear Taxonomy is Kingdom: Animalia; Phylum:	Chordata; Class: Mammalia; Order: Carnivora; Family: Ursidae; Genus: Ursus; Species: arctos; Scientific Name: Ursus arctos. Alaska Polar bear stock photos, Ursus maritimus photos. Polar bears are marine mammals of the arctic, and inhabit the circumpolar regions of the northern hemisphere. Listed as threatened species in the US by the Fish and Wildlife Service, polar bears face the threat of habitat loss from global climate change. Polar bear photos on this page include adult polar bears, male and female polar bears and polar bear cub photos. Mostly taken in Arctic Alaska, in the Beaufort Sea and edges of the Arctic National Wildlife Refuge. Stock photos of polar bears. More polar bear photos here here. Polar bear photo tour details here. CanidaePhotos of Canids, or Canidae, including wolves, foxes and coyotes. Canidae is the dog family of the world, with members of this family found on virtually every continent on earth (only Antarctica is devoid of native canids). Canids are an extremely adaptable family of species, and can be found from sea level to altitudes over 5000m (or 16 000 feet). Though taxonomists differ with their classifications, most taxonomists suggest their are around 35 species of canids in the world. This gallery of photos includes red fox photos, arctic fox photos, wolf photos and coyote photos, largely from Alaska and Canada. Stock Photos of Arctic Foxes, Vulpes lagopus. Arctic Foxes on the coastal plain in Arctic Alaska, on the Arctic National Wildlife Refuge, or ANWR, Alaska. Arctic fox populations are becoming threatened by encroachment of the larger red fox species, as they move further north into habitats they weren't previously able to survive in. Global Climate Change is threatening the survival of many species in the arctic. Wild coyote photos. Coyotes from the Yukon to Yellowstone, photos of Coyotes in Jasper, Canada. Coyote pups and adult coyote photos. Coyote Taxonomy is Kingdom: Animalia; Phylum: Chordata; Class: Mammalia; Infraclass: Eutheria; Order: Carnivora; Family: Canidae; Genus: Canis; Species: latrans; Scientific Name: Canis latrans. Arctic fox photos, red fox photos and cross fox photos. The red fox is Vulpes vulpes and arctic fox is Vulpes lagopus. Fox pictures from British Columbia, Canada, and Wrangell - St. Elias National Park, Alaska, Denali National Park, and the Arctic National Wildlife Refuge, ANWR, arctic Alaska. Fox kits, or pups, and adult foxes. Red fox Taxonomy is Kingdom: Animalia; Phylum: Chordata; Class: Mammalia; Order:	Carnivora; Family: Canidae; Tribe: Vulpini; Genus: Vulpes; Species: vulpes; Scientific Name: Vulpes vulpes. Wild wolf photos. Photos of wild wolves from Denali National Park, Alaska, and wolf photos from Jasper National Park, Canada. These pictures are all pictures of wild wolves, not captive animals. Wolves are typically gray, though color morphs range from black wolves to almost white wolves. The black wolves are the most voracious. There are numerous schools of thought on the taxonomy of wolves, and various subspecies, though few scientists agree on exactly what they might be. So, to the species level, taxonomy for North American wolves is Kingdom: Animalia; Phylum: Chordata; Class: Mammalia; Order: Carnivora; Family: Canidae; Subfamily: Caninae; Tribe: Canini; Genus: Canis; Species: lupus; Scientific Name: Canis lupus. Marine MammalsPhotos of marine mammals. There are nearly 130 species of marine mammals, all of which rely on the ocean for their survival. Marine mammals have adaptions to life in the ocean, such as a thick layer of blubber or far, streamlined bodies for swimming, circulatory adjustment abilities to help conserve body temperature, they store extra oxygen in their blood and muscles. Marine mammals are divided into 4 different subgroups, the pinipeds (seals, sea lions, etc), cetaceans (whales, etc), sirenians (manatees, and dugongs) and fissipeds (includes the polar bear). Marine Mammals are protected by US Law under the Marine Mammal Protection Act of 1972. Many species of marine mammals remain threatened and/or endangered. Stock photos of Alaska Harbor Seals, from Katmai National Park and Preserve, and from Wrangell - St. Elias National Park and Preserve. Harbor seals, or Phoca vitulina, are pinnipeds, also true seals, and are also frequently known as Common seals. UngulatesUngulate Family - Stock photos of Ungulates. Ungulate means 'hooved animal'. The family Ungulates is usually split into 2 grips, even toed ungulates and odd-toed ungulates, with some other smaller groups (including elephants) as well. Ungulate photos on this website include caribou, moose, white-tailed deer, elk and muskoxen, as well as various members of the sheep families, such as Dall sheep, bighorn sheep and also mountain goats and pronghorn. Bighorn sheep photos. Ovis canadensis. Bighorn rams and bighorn sheep lambs from Jasper National Park, Alberta Canada. Full curled or full curl trophy bighorn rams. Bighorn sheep Taxonomy; Kingdom: Animalia; Phylum: Chordata; Class: Mammalia; Order: Artiodactyla; Family: Bovidae; Subfamily: Caprinae; Genus: Ovis, Species: canadensis; Scientific Name: Ovis canadensis. Stock photos of bison, also commonly and incorrectly called buffalo. Bison bos, from Yellowstone National Park, and bison from Custer State Park. These are Plains bison, one of 2 subspecies of American bison. The other species are wood bison. Photos of bull bison, cows and bison calves. Bison taxonomy is Kingdom: Animalia; Phylum: Chordata; Class: Mammalia; Order: Artiodactyla; Family: Bovidae; Subfamily: Bovinae; Genus: Bison; Species: bison; Scientific Name: Bison bison; Subspecies include Bison bison bison (Plains bison) and Bison bison athabascae (Wood bison). Caribou photos, Rangifer tarandus. Some Woodland caribou photos here, but most of these caribou photos are the more common Barren Ground caribou, found in Denali National Park, Alaska and also Wrangell St. Elias National Park. Images of caribou from the Arctic National Wildlife Refuge, ANWR, Alaska. Bull caribou photos, and cows and calves. Woodland caribou belong to the subspecies Rangifer tarandus caribou and Barren ground caribou to Rangifer tarandus groenlandicus. Dall sheep stock photos, from Denali National Park, Alaska, and also Dall sheep pictures, rams, ewes and lamb photos from Wrangell - St. Elias National Park, Alaska. Oringially called Dall's Sheep. Full curled trophy ram photos. Ovis dalli dalli images. Dall sheep Taxonomy is Kingdom: Animalia; Phylum: Chordata; Class: Mammalia; Order: Artiodactyla;, Family: cabras; Subfamily: Caprinae; Genus: Ovis; Species: dalli; Scientific Name: Ovis dalli. Wapiti, or Elk photos. The native American name for elk is wapiti. Cervus elaphus images. Stock photos of bull elk from Jasper National Park the Yukon Territory, Canada. Bull elk photos from Yellowstone National Park. Bugling Bull elk photos, and elk flehmen, fighting and rutting elk photos. Elk taxonomy is Kingdom: Animalia; Phylum: Chordata; Class: Mammalia; Order: Artiodactyla; Suborder: Ruminantia; Family: Cervidae; Subfamily: Cervinae; Genus: Cervus; Species: canadensis; Scientific name: Cervus canadensis. Fannin sheep photos; Fannin sheep, or Fannin's Sheep are either a subspecies or color morph of the Dall Sheep. Fannin sheep are found in the Pelly Mountains and Ogilvie Mountains of Yukon Territory. Ovis dalli fannini images from Yukon Territory, Canada. Taxonomy for the Fannin Sheep is Kingdom: Animalia; Phylum: Chordata; Class: Mammalia; Order: Artiodactyla;, Family: cabras; Subfamily: Caprinae; Genus: Ovis; Species: dalli; Scientific Name: Ovis dalli fannini. Moose photos, Alces alces. Bull and cow moose photos from Denali National Park, Alaska. Trophy bull moose photos. Moose pictures from Yukon Territory, Canada, and Wrangell St. Elias National Park, Alaska. Photos of moose calves around Anchorage, Alaska, in Kananaskis Country, Alberta, Canada. North American moose taxonomy is Kingdom: Animalia; Phylum: Chordata; Class: Mammalia; Order: Artiodactyla; Family: Cervidae; Subfamily: Capreolinae; Genus: Alces; Species: laces; Scientific Name: Alces alces. Mountain goat photos, North American mountain goat, also called the Rocky Mountain goat. Oreamnos Americanus images Most of these mountain goat photos are from Wrangell - St. Elias National Park, Alaska. Mountain goats, Chugach mountains, photos of mountain goat kids and nannies. Taxonomy for the Rocky Mountain or North American Mountain Goat is Kingdom: Animalia; Phylum:	Chordata; Class:	Mammalia; Order: Artiodactyla; Family: Bovidae; Subfamily: Caprinae; Genus: Oreamnos; Species: americanus; Scientific Name: Oreamnus americanus. Photos of muskox, or muskoxen photos, Ovibos moschatus images; also Musk Ox photos, Muskox on the arctic coastal plain, Arctic National Wildlife Refuge, ANWR Muskox herd or musk ox pictures, Alaska. Musk taxonomy is Kingdom: Animalia; Phylum: Chordata; Class: Mammalia; Order: Artiodactyla; Family: Bovidae; Subfamily: Caprinae; Genus: Ovibos; Species: moschatus; Scientific Name: Ovibos moschatus. Pronghorn Photos, Custer State Park, South Dakota. Pronghorn antelope photos - though pronghorn are not an antelope, but are more closely related to the American mountain goat species. Correct common name is Pronghorn. Antilocapra americana images. Pronghorn taxonomy is Kingdom: Animalia; Phylum: Chordata; Class: Mammalia; Order: Artiodactyla; Family: Antilocapridae; Genus: Antilocapra; Species: americana; Scientific Name: Antilocapra americana. Whitetail deer photos, or white-tailed deer, Odocoileus virginianus images. Photos of whitetail bucks from Cades Cove, Great Smoky Mountains National Park, Tennessee. Whitetail deer, or white-tailed deer, females are called does and the males are called bucks. The breeding season is called the rut, trophy whitetail buck pictures.